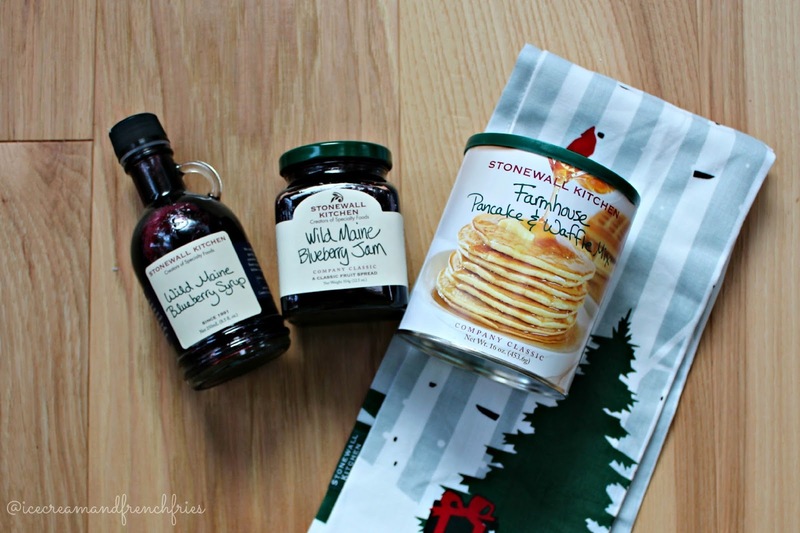 Happy Healthy Home: Breakfast Essentials + Stonewall Kitchen Giveaway! 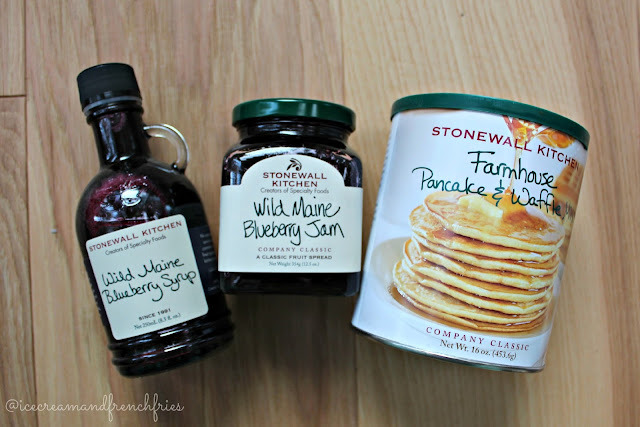 Breakfast Essentials + Stonewall Kitchen Giveaway! Life is better with breakfast. It's the most important meal of the day. With the Holidays upon us it means there's even more reasons for breakfast/brunch at home! To make breakfast at home easy there are a few essentials you'll need. 1. Breville Juicer - I love a glass of fresh squeezed OJ with pancakes plus it will take your mimosa game to the next level. 2. Pancake Molds - Although Emerson isn't old enough to realize her pancakes are in fun shapes I can't wait! These are perfect for christmas morning. 3. Spatula - The key to perfect pancakes is a great flip. Well you can't have a great flip without the perfect spatula. I personally like OXO kitchen utensils. 4. Non-stick griddle - From grilled cheese to pancakes this griddle is a kitchen staple. 5. 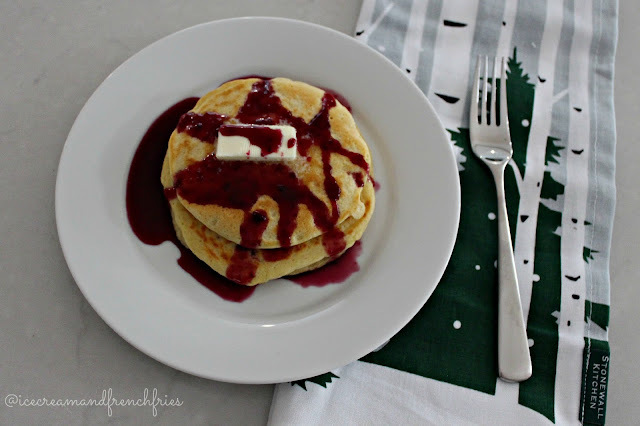 Stonewall Kitchen Holiday Blueberry Breakfast [c/o] - Of course you can't have killer pancakes without a delicious batter and syrupy! 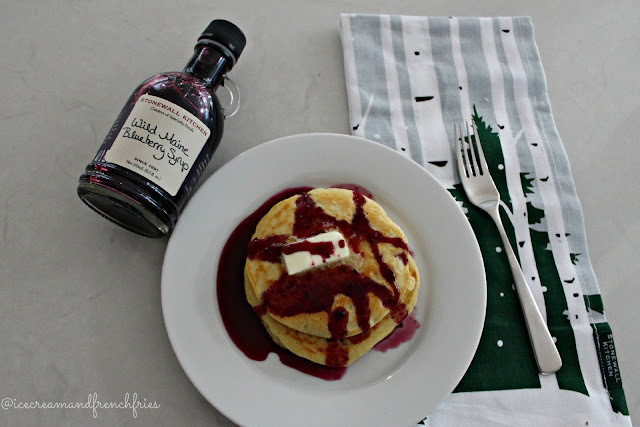 I've always been a berry person, I'm loving Stonewall Kitchen's blueberry syrup. Stonewall Kitchen recently sent yours truly the Holiday Blueberry Breakfast box to test out. The set includes blueberry syrup, jam, pancake/waffle mix and a festive hand towel. 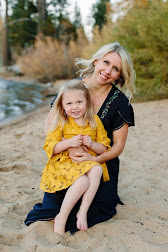 It was stormy on Sunday which made a perfect excuse to make pancakes, decorate our christmas tree and snuggle on the couch with my baby girl and a cozy fire. The pancakes turned out light and fluffy! I topped my pancakes with a little butter and blueberry syrup! Oh, the syrup! 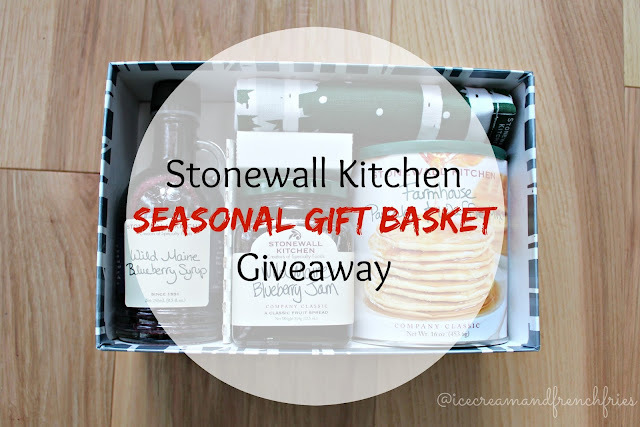 In partnership with Stonewall Kitchen they are giving one lucky reader a Seasonal Gift Basket! 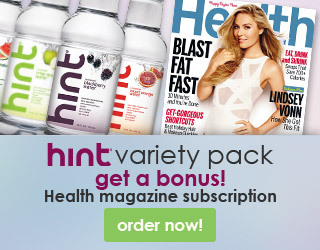 You'll be able to pick one of the following Seasonal Gift Baskets -- Cocktail Party, Grilling Collection, Blueberry Breakfast or Italian dinner. Maine based, Stonewall Kitchen is known for its delicious speciality foods that are perfect for all your entertaining needs. Additionally they have a variety of famous jams, dips and New England flavors that make great gifts for everyone on your shopping list. For the holidays they offer seasonal gift baskets​ ranging in price from under $10 to $100+ filled with everything from holiday jams and indulgent confections to seasonal spices and flavors to festive meals and party essentials. 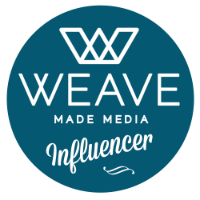 To Enter: Please use the Rafflecopter widget below to enter (it might take a second to load, but it should eventually pop up below this paragraph). This giveaway is available for USA residents. Please note, only entries via Rafflecopter will be eligible to win. Thank you and good luck! I'd get the Maine Morning Breakfast Gift! My parents live in Maine AND right near Stonewall! We visit their shop often and I ADORE it. 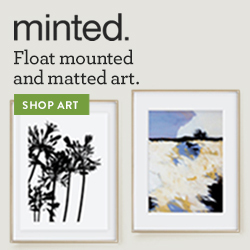 So happy to see these products being highlighted! I would love the cocktail gift! I'd love the holiday Italian dinner! Yum... that blueberry syrup has my name ALL OVER IT!!! I love pancake molds but my cakes always get stuck in them. Any tips?? Oh wow, that pancake gift basket says "weekend!" to me - I think I'd pick that one too!! I would LOVE the breakfast gift basket! I love the Farmhouse Batter Bowl Gift. I think those pancake molds are so cute! My kids would love shaped pancakes! I would pick Holiday Blueberry Breakfast. The Italian holiday sampler looks amazing! The holiday jam collection! Strawberry CHAMPAGNE JAM?!?!? I'd pick the Holiday Blueberry Breakfast. I'd have to go with the Holiday Grilling Gift Basket for my fiance! I would love to have the For The Baker collection.